Once again, I found myself without a fresh sock on the needles. No, no, no. 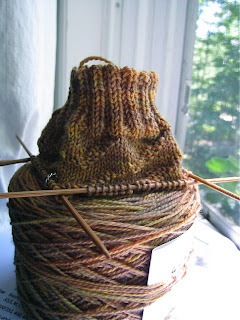 So I cast on this little sock sprout, Anne Hanson’s Caterpillar Socks. The yarn is one of Sundara’s elusive ones — Grey over Golden. It wants to photograph orange, when really the grey and golden give the yarn a greenish tone. Anyway, this is the right yarn for the pattern. I though about making something lacey, but this color doesn’t want to be lace. I finished the Artichoke socks in the middle of the night. I’ve been sleeping well lately, but I wake up at odd times and I’m just not sleepy any more, so I get up. Without a work routine I can’t really tell myself that I must go back to sleep because I have to be up at 5:30. For the time being I don’t have to be up until I’m darn well ready. So I knit most of this pair in the wee hours, and finished them while I watched yet another episode of Law and Order. If I happen across one, I can’t seem to change the channel. Sad. The socks are nice, though! This week I’ll be starting the next phase of this thing known as Having Cancer — I’m going to have a short course of radiation, once a week for four weeks, which will be followed by chemotherapy after a two- or three-week break. The original idea had been to start chemo as soon as I was well enough, but after consulting with a radiation oncologist we decided that this is the best course. It’s more insurance against a recurrence in the future. I’m very comfortable with the plan, because I want the best outcome and I’m willing to put up with what it takes to get there. Every time there’s been something new thrown at me — the radiation consideration, chemo options, etc. — I get in the car to come home and I’m practically giddy. Judy and I laugh as she drives down the highway, because who in their right mind would be giddy when told they have to have chemo and they’ll lose their hair? Me. I’m giddy because at least I know. I have answers, I have a plan, and that makes me feel powerful. I am powerful. And hey, I just might have curly hair when it grows back. That Caterpillar looks like it’s going to turn into a Butterfly! Very pretty. Thoughts and prayers continue. The socks look wonderful and you sound positive. Keep up the good work and I’ll keep positive thoughts for you. I love your determination. You are powerful! Where I used to work, there was a guy whose hair came back with the most beautiful curls. The Artichoke socks are gorgeous. Sending positive thoughts your way this week. hmmm….curly hair. Might be nice! We were just talking about those perms we got all those years ago. I have a friend who underwent chemo and her hair came back really curly! Now it’s reverted to her normal straightness. It’s good to have a PLAN!You are marvelous at socks. No, you ROCK at socks.Sending you even more power and xxxx’sP.S. are you going to knit yourself a hat? 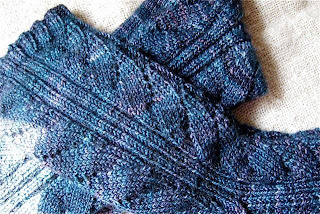 I’m making those artichoke socks too (great minds think alike, no doubt)Yes… I think that you are amazing – such a profoundly wonderful attitude.You rock, my friend. GO GIRL!!!!!!! Oh, and keep knitting. Yummy socks, I just adore that yarn. Hey, how about knitting a wig? Now that would make a statement.You are my hero. That is one heck of a way to get curls, but, hey, whatever works, eh?Big hugs from this Coast. The socks are so lovely.Plans are great, aren’t they? I’m so glad your medical team is doing right by you. And if you decide, pre- or post-chemo, that you would like to experience punk rock hair colors that will remind you of tropical fish or birds or Sundara’s yarns, I’m your huckleberry. You are fantastically powerful, deeply soulful and – well – just plain old good.And your socks are rockin’ too! I love the socks, and love your outlook. You are an amazing lady, lady.